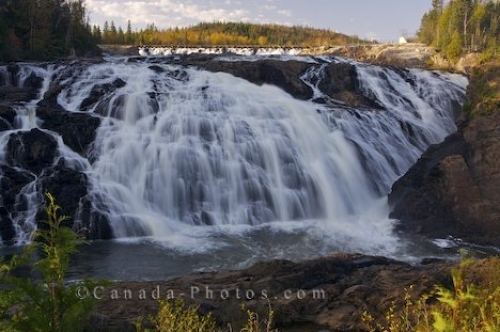 While visiting the town of Wawa, Ontario, be sure to make a trip to Magpie High Falls along the Magpie River where the scenery is breathtaking. Spread out for approximately 125 feet across the rock ledges which forms the basis for Magpie High Falls near the town of Wawa, Ontario, the water cascades to the pool below before continuing its journey along the Magpie River. Magpie High Falls is 75 feet high and when a mass of water flows, the noise echoing across the landscape sounds like thunder. The scenery around the Magpie River is one that is made up of wilderness as tall forest trees decorate both banks of the river. Autumn is an extremely pretty time of year around the falls as the scenery becomes highlighted by the mass of colors changing with the seasons. Every year, the Magpie High Falls is seen by about 20,000 visitors who come to the town of Wawa, Ontario to enjoy the scenery and relax near the rushing water while having a picnic. Magpie High Falls is located south of the town of Wawa and one must follow the signs and then the gravel road for about 1 1/2 kilometers to get to the base of the falls. Picture of the scenery of Magpie High Falls where the water cascades over the ledges along the Magpie River near Wawa, Ontario. Magpie High Falls along the Magpie River near the town of Wawa, Ontario, Canada.